Quick Take: Dog The Bounty Hunter, "And Baby Makes Three"
Review: Dog The Bounty Hunter, "And Baby Makes Three"
(S0801) It's kind of hard to admit this, but at a particular point in the not too distant past I was pretty into Dog The Bounty Hunter. The show had recently premiered and it had yet to hit its cultural tipping point. I was in college and every day my roommates and I would smoke and drink and watch Dog. The show became something of an ongoing bit within our circle of friends. We would call each other "brah" or "Leland" and warn one another to "stay off 'da ice." After a while, the show became repetitive, then the whole N-Word-gate thing happened, and we moved on to other shows and other bits. A few years have passed I've seen an episode of Dog The Bounty Hunter, and when checking out the eighth season premiere, I was curious what my reaction to the show would be. Would time away from Dog and Beth make their goofiness fresh again? Or would I just see a couple of washed up old racists playing out the string on their fifteen minutes of fame? For the most, part my reaction to "And Baby Makes Three" was the latter. Leland is still a lovable dunce, and Duane Lee is relatively affable. But Dog and Beth are pretty awful. They're cartoons, but not the funny kind. They're selfish, mean spirited cartoons, kind of like Allen Gregory. What's worse is that they seem too willing to cross the line from bounty hunters to vigilantes. Their over-zealousness, disregard for civil liberties, and penchant for turning family members against one another is actually quite disturbing. On last night's episode, the Da Kine Bail Bonds crew goes after Derek Kirkpatrick, a career criminal who skipped bail after robbing a jewelry store. They scare Derek's sister into giving up the location of his safe-house by threatening to take her mother's house, which was used as collateral for the bond. In the middle of the night, Dog and his family of hunters surround the house where Derek is hiding. Suddenly Derek bursts out of the house and sprints up the block. With Leland at a Lamaze classes in anticipation of the birth of his first daughter, the team is without its fastest member and the fleet-footed Derek escapes. The Da Kine crew fans out into the surrounding neighborhood to try to track him down. They enter private garages and backyards with flashlights and weapons drawn dressed in their typical SWAT team outfits. If I lived in that neighborhood and I saw one of them poking around in my backyard with a gun I would be terrified. It's important to remember that Dog is a BOUNTY HUNTER, not a police officer, not a FBI agent, not even a security guard at a bank. These people have no right to go storming through private property, trampling flower beds and wreaking havoc in a sleepy residential neighborhood. They show such little regard for other people that I honestly started to root for Derek the jewelry thief to come out on top. Of course that didn't happen. Leland comes back from him Lamaze class and regroups with Dog. They get a fresh lead of Derek's whereabouts and when they strike this time, Leland is fast enough to chase him down. I have to give the show credit here: The final showdown between Leland and Derek is shot and edited in such a way that it draws the maximum amount of tension and drama out of the situation. 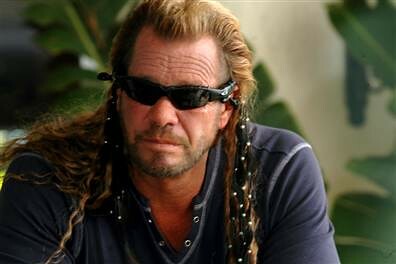 But I never watched Dog the Bounty Hunter for drama, I watched it to laugh at how silly Dog looked with his hair braided with a feather. Dog still has that feather in his hair, but I couldn't muster any laughs last night. In fact, pretty much everything about the show is the same as I remember it and yet I didn't find it the least bit amusing. Maybe I've just changed.